El portavoz presidencial Robert Gibbs dijo a través de una breve declaración que Estados Unidos está listo para ayudar al pueblo chileno en esta hora de necesidad. Washington.- La administración del presidente estadunidense Barack Obama brindó hoy ayuda al gobierno y pueblo de Chile, tras el terremoto de 8.8 grados en la escala de Richter que azotó esta madrugada al país sudamericano. Agregó que la situación se monitorea ante la posibilidad de tsunamis en las costas estadunidenses. El Departamento de Estado señaló asimismo su disposición a ayudar a Chile, así como a velar por el bienestar de los estadunidenses que residen o estaban de visita en ese país. Se estima que alrededor de mil estadunidenses residen en la zona más afectada por el sismo. Hasta el momento dos trabajadores diplomáticos de Estados Unidos en Chile están desaparecidos. Estados Unidos se mantiene en alerta ante un eventual tsunami que podría llegar a la costa de estado de Hawai. informó que personal de salvavidas, policías turísticos estatales y municipales fueron desplegados principalmente en Acapulco, donde se colocaron banderas rojas desde las 8 hasta las 10:30 de la mañana. Ciudad de México.-Luego de la alerta emitida por Estados Unidos del incremento de los niveles del mar y probable tsunami en las costas del Pacífico, derivado del sismo de 8.2 grados que azotó a Chile, en las playas de Guerrero se desplegó un operativo desde la primeras horas de éste sábado, hasta que dieron por concluida la alerta, informó el secretario de Seguridad Pública y Protección Civil del Gobierno de Guerrero, Juan Heriberto Salinas Altés. El funcionario agregó que personal de salvavidas, policías turísticos estatales y municipales fueron desplegados principalmente en Acapulco, donde se colocaron banderas rojas desde las 8 hasta las 10:30 de la mañana, “el alertamiento ha cesado y los elementos fueron retirados de la playas junto con las banderas que se colocaron para proteger a los turistas y a las palapas que hay en las zonas turísticas”, mencionó Salinas Altés. Este incidente coincide con el inicio de la temporada de Spring Break en Acapulco, donde ya unos 500 estudiantes de la Universidad de Michigan se encuentran en este destino de playa. Mientras tanto, el gobierno del estado citó a conferencia de prensa pasado el mediodía donde el jefe del departamento de Hidrometeorología de la Subsecretaría de Protección Civil, Roel Ayala Mata, hablará sobre las posibles en la entidad por el sismo en Chile. La alerta de tsunami en las costas de Guerrero, en especial en el puerto de Acapulco, parece que podría descartarse, después del terremoto de 8.8 grados Richter que azotó a Chile. Un integrante del Servicio Sismológico Nacional, Víctor Hugo Espínola, manifestó a la cadena de noticias CNN que el comportamiento del mar en el puerto sí ha tenido modificaciones, pero no para generar pánico. “Sólo hemos visto que el aumento del mar ha sido de 30 centímetros en Acapulco, la verdad no es nada espectacular, además quiero dejar claro que estos datos son de hace dos horas, las cuales no han cambiado hasta el momento”, dijo. Sobre las recomendaciones para los habitantes y turistas que se encuentran en la playa mexicana, Espínola fue claro al señalar que deben esperar y mantener la calma. “Sólo puedo recomendar que mantengan la clama y esperen las recomendaciones necesarias, además se dará un nuevo reporte dentro de dos horas para no generar tensión o confusión”, apunto. Finalmente, Víctor Hugo Espínola confesó que el personal de este centro está laborando desde las primeras horas de este día, después de enterarse del terremoto en las costas del Océano Pacífico. There would have been hundreds of thousands dead if it had not been for Chile putting in place, earthquake resistant building codes. I still do not understand why so many roadways, bridges and support columns in buildings gave way as if they had no integrity at the point of connection to their primary structures. There are places with nothing but rubble, but many, many buildings in Chile that have been shown on the news have compartments where people’s living spaces stayed intact, even though portions of the buildings were damaged. That is remarkable and has definitely resulted in lower numbers of casualties than what would have occurred. In California and other earthquake prone areas, I wish they would bring every single building and residence up to a code standard of earthquake resistance, including the use of everything the recent earthquakes in Haiti and Chile, L’Aquila and Sichuan have taught us. There are too many structures which still need to be retrofitted for earthquake resistant measures. It still seems that we desperately need a masonry building material / cement / mortar recipe that works extremely better during earthquakes, tsunamis, tornadoes, hurricanes, under extreme stresses / fatigue and especially during extreme events. It continues to be that the mortar is the weak point in the structures with the resulting catastrophic failures of those building materials during extreme events in particular. Thank God for the leaders, builders, engineers and construction specialists in Chile that have made sure so many of these buildings and structures did have earthquake resistant building measures used. Where those measures did not fully protect, they simply did make the loss of life and damages to human life far less than it could have been. It is truly amazing to see the pictures with areas where people were living in buildings survive the earthquake intact. Truly amazing. We need to do that everywhere as part of the process of building, rebuilding and as a policy, to retrofit every structure to be better able to withstand extreme events, particularly earthquakes – especially where people could be inside those structures. The Chile tsunami was generated by a Mw 8.8 earthquake (35.846°S, 72.719°W ), at 06:34 UTC, 115 km (60 miles) NNE of Concepcion, Chile (according to the USGS). In approximately 3 hours, the tsunami was first recorded at DART® buoy 32412. Forecast results shown below were created with the NOAA forecast method using MOST model with the tsunami source inferred from DART® data. The tsunami waves first arrived at Valparaiso, Chile (approximately 330 km northeast from earthquake epicenter ) earlier than other tide gages, at 0708UTC, about 34 minutes after the earthquake. The graphics to the left display forecast results, showing qualitative and quantitative information about the tsunami, including tsunami wave interaction with ocean floor bathymetric features, and neighboring coastlines. Tsunami model amplitude information is shown color-coded according the scale bar. Although a tsunami cannot be prevented, the impact of a tsunami can be mitigated through community preparedness, timely warnings, and effective response. NOAA has primary responsibility for providing tsunami warnings to the Nation, and a leadership role in tsunami observations and research. The Tsunami Story: Generation, propagation, warning systems, forecasts and reduction of impacts. Basic information about Tsunamis & What’s happening now? This earthquake occurred at the boundary between the Nazca and South American tectonic plates. The two plates are converging at a rate of 80 mm per year. The earthquake occurred as thrust-faulting on the interface between the two plates, with the Nazca plate moving down and landward below the South American plate. Coastal Chile has a history of very large earthquakes. Since 1973, there have been 13 events of magnitude 7.0 or greater. The February 27 shock originated about 230 km north of the source region of the magnitude 9.5 earthquake of May, 1960 – the largest earthquake worldwide in the last 200 years or more. This giant earthquake spawned a tsunami that engulfed the Pacific Ocean. An estimated 1600 lives were lost to the 1960 earthquake and tsunami in Chile, and the 1960 tsunami took another 200 lives among Japan, Hawaii, and the Philippines. Approximately 870 km to the north of the February 27 earthquake is the source region of the magnitude 8.5 earthquake of November, 1922. This great quake significantly impacted central Chile, killing several hundred people and causing severe property damage. 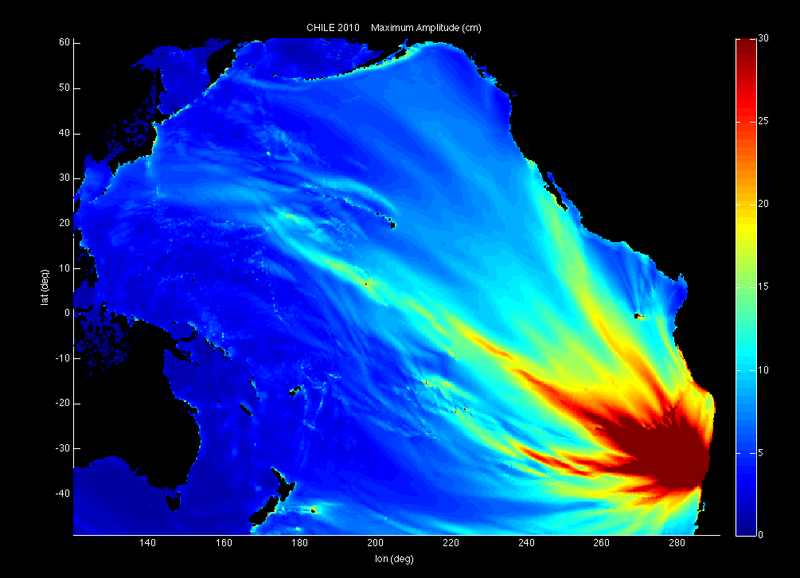 The 1922 quake generated a 9-meter local tsunami that inundated the Chile coast near the town of Coquimbo; the tsunami also crossed the Pacific, washing away boats in Hilo harbor, Hawaii. The magnitude 8.8 earthquake of February 27, 2010 ruptured the portion of the South American subduction zone separating these two massive historical earthquakes. A large vigorous aftershock sequence can be expected from this earthquake. Coastal Chile has a history of deadly earthquakes, according to the USGS. Since 1973, there have been 13 quakes of magnitude 7.0 or higher. Saturday’s epicenter was just a few miles north of the largest earthquake recorded in the world, a magnitude 9.5 quake in May 1960 that killed 1,655 and unleashed a tsunami that crossed the Pacific. The earthquake off the west coast of South America caused a tsunami that reached the Hawaiian Islands in about 15 hours. This tsunami caused little damage elsewhere in the islands, but the Hilo Bay area was hard hit. Sixty-one people lost their lives and about 540 homes and businesses were destroyed or severely damaged. The wave heights in Hilo Bay reached 35 feet compared to only 3-17 feet elsewhere. CNN’s Rolando Santos, Brian Byrnes and Patty Lane contributed to this report.